This is a great horned owl recovering in the Shalin Liu Healing Cage. It is conditioning and re-acclimating to the outdoors while it prepares for its release after being hit by a MBTA train in Jamaica Plain on July 22, 2017. Upon initial exam, the owl had a swollen foot and evidence of head and eye trauma. These problems often result in reduced vision and depth perception, which can affect balance and coordination. All of these clinical signs were consistent with trauma seen from the impact of the owl hitting the train. With supportive care, pain medication, and time, the owl slowly improved and is in the final stages of flight testing preparing for its release back out into the wild. The stance seen in this photograph is a common defensive stance made by great horned owls. 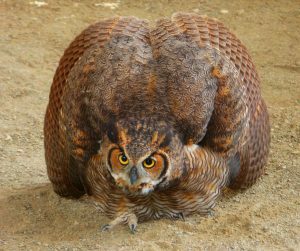 This posture makes the owl appear much bigger and more intimidating, often deterring an unwanted encounter.